I recently read an article about edamame and all of its amazing health benefits. If you don’t know much about edamame, it is a green soybean that is a great source of protein, contains all 8 essential amino acids and has no cholesterol of trans-fats. It is high in fiber and iron as well. I’ve like edamame for a while now, but this just makes eating it even better! It is a great addition to many meals and is definitely one to try if you haven’t yet. 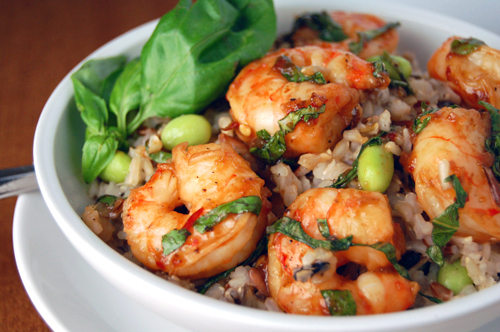 This dish is simple- marinated shrimp and rice with edamame. When sautéing the shrimp, deglazing the pan adds a ton of flavor that regular sautéing wouldn’t. 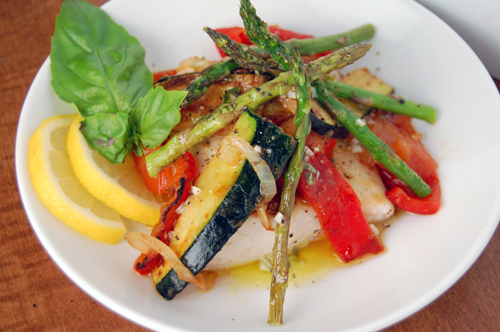 Sometimes nothing can beat a home-cooked Italian meal. I don’t make pasta much after working at Noodles & Co. for a year, but oh man these were good. I would hardly put these into the pasta category; they are so rich and delicious! 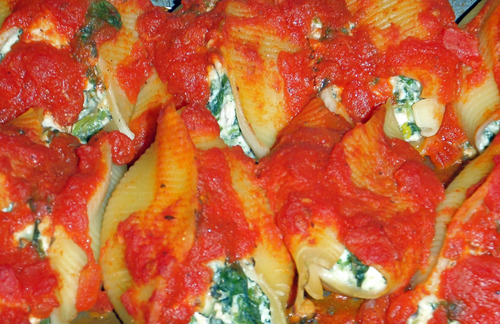 For this week’s throwback recipe, I give you my turkey, spinach and cheese stuffed shells. Stuffing these bad boys was a bit of work, but it was totally worth it. Once they are done and you bite into their gooey, cheesy goodness you will understand. The finalists were announced finally for the Ritz recipe contest, unfortunately I didn’t make finals. It’s okay though, there were over 1,400 entries… that is a lot of competition. Looks like I have to find another way to fund my culinary school. If anybody knows of any good scholarships or ways to get money for culinary school PLEASE let me know! Here is my entry for the Ritz recipe challenge. I used crushed Ritz crackers in the tartlet dough to give it some extra flavor. These little bites will have your guests drooling over the appetizer table. I ended up eating the entire batch over a few days! Before I say anything about this recipe, I would like to announce the end of my comfort food bender. As good as all of the pizza and mac ‘n’ cheese has been, I am cleaning up my act. That’s not to say it won’t happen again sometime in the next few months, but for now I am going to be eating (and blogging) a bit healthier. I will be baking a bit though. 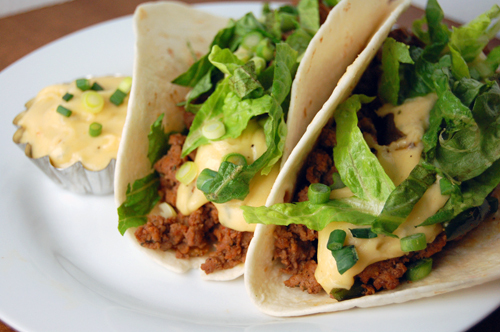 For my final post of my bender, I give you these spicy, cheesy and tasty tacos. First, I combined chorizo and beef for the base of these tacos, which makes the filling a bit more exciting. Then I added some spice with the seasonings and poblano chiles. To top it off, I made a pepper jack cheese sauce to pour over the tacos. Top them off with some lettuce and green onion and there you have it- a unique taco that will have you coming back for seconds (and more cheese sauce!). Watching the Food Network can be dangerous sometimes. A few of my guy friends recently learned why I am so addicted to it after they watched a couple shows one night with me. Every recipe you see makes your mouth water and makes your hungry. 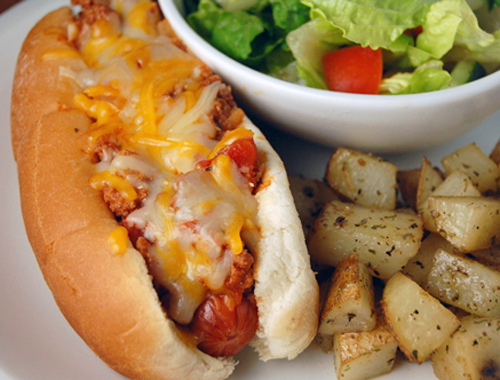 This week we all found ourselves drooling over a chili cheese dog from some small-town diner. Being from Britian, my friends had never eaten a chili cheese dog, so I had to show them what they were missing! This chili cheese dog is a bit different from others because it uses as bison chili instead of beef. 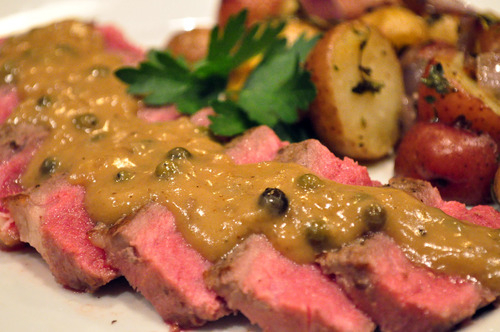 The bison does not taste much different than the beef, but gives it a bit of new flavor. This recipe can easily be made with ground beef instead. Before you eat these bad boys, make sure you have a napkin and aren’t wearing a white shirt! Stir-fries are great for a quick week-night meal. You can combine so many different flavors, which means endless ideas. This particular stir-fry was my first attempt as making a sweet and sour sauce. I apologize for the photo quality, it was from my early days of blogging and taking food photos. It reminds me how far I have come and how much further I can go. 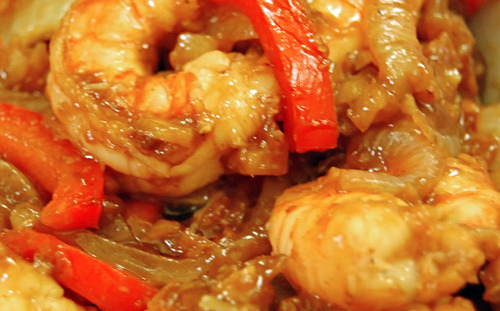 So, for a healthier dinner, try this tasty sweet and sour dish. For some reason, I have been craving comfort food lately. It is probably not a good thing, considering I am going to Africa to the beach for three weeks, one month exactly from today! Oh well, what can you do. Cheese is one of my biggest weaknesses. I could probably eat an entire block of cheese as a snack, but I am getting off the topic.